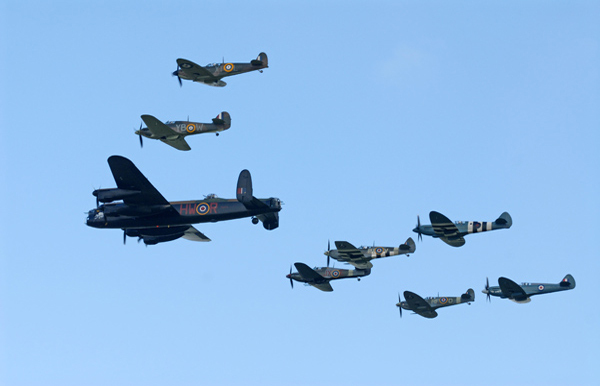 The Royal AirForce Battle of Britain Memorial Flight (RAFBBMF) operates from RAF Coningsby, a Typhoon and fighter base, in Lincolnshire. Flown by regular serving RAF Aircrew, the Flight operates six Spitfires, two Hurricane Mk 2Cs, a Lancaster as well as a C47 Dakota and two Chipmunk aircraft (primarily used for training). The unit is commanded by Squadron Leader Andy Millikin. From May to September each year, these aircraft can be regularly seen in the skies over the UK celebrating and commemorating public and military events from State occasions such as Trooping the Colour to major air displays and simple flypasts for public events. We are proud to have HRH Prince William, Duke of Cambridge as our Patron. The motto of the RAF BBMF reflects our mission and honours the thousands of men and women, in the air and on the ground, that gave their lives for this country in the noble pursuit of freedom.